Bodie was a former gold-mining town that was founded as a mining camp in 1859 after the first tiny nugget was found. 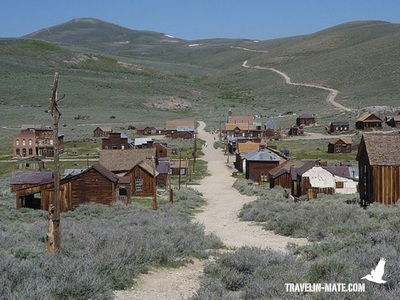 Due to its remote location and the bootless mining the town wasn’t in people’s mind until a mining company made the first and huge profit in Bodie. Within a few years the camp turned into a town with a population of 10,000 and almost 2,000 buildings during it’s peak times. From 1880 the population declined in Bodie due to other more profitable mining camps. In the early 20th century there were less than 800 people living in the town that changed from mining to a community town. 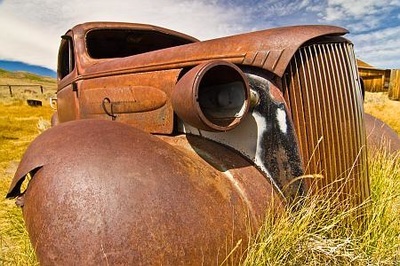 The first mine closed around 1912 the last in 1942 and Bodie finally became a Wild West ghost town. In the first part of the 20th century vandalism destroyed most of the town’s buildings and grounds but thanks to some landowners who protected and maintained their land some parts a total of 117 buildings are well preserved. In 1962 the State of California turned Bodie into a State Historic Park and preserved everything as it was left from the residents. The State Park is open all year round to visitors but the access road might be closed during winter. 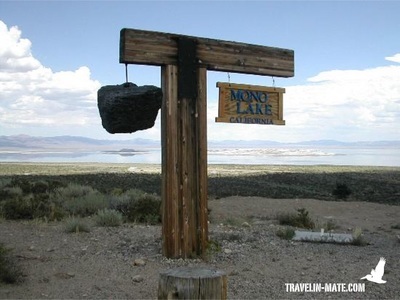 Next to Tioga Pass within Sierra Valley lies Mono Lake. 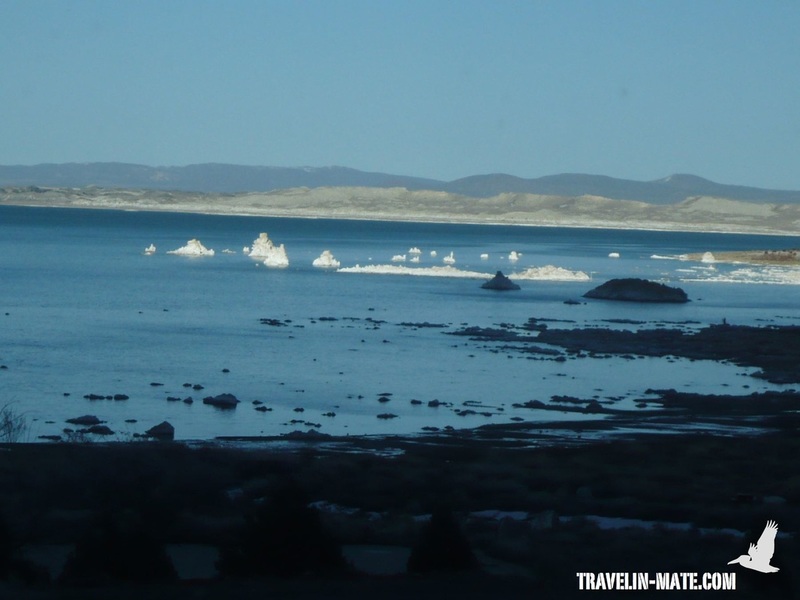 The lake is known for being 2 ½ times saltier than the ocean and very alkaline since it has no outlet to an ocean. Believing geologists it was formed 760,000 years ago. Coming from the mountains the lake is already visible for miles. 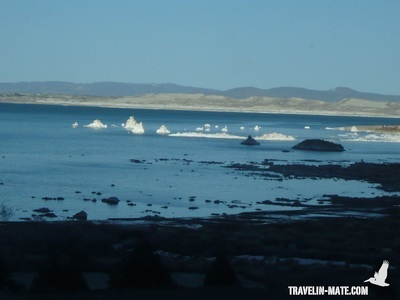 Those funny sculptures inside the lake are carbonate towers, which were formed through the interaction of freshwater springs and alkaline lake water. 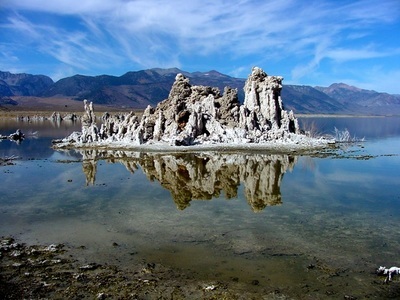 They exist of calcium carbonate and are sticking out the lake best visible during low water level. These funny formations are called Tufa Towers. The lake’s visitor center provides more detailed information and a walking map. Last but not least you can use a boat exploring the lake or even go swimming. There is the rumor that if you have some health issues a bath in the lake cures everything. Just make sure that you keep the water out of your eyes or away from any cuts. The lake is also a favorite photo spot since the light reflections from the water, desert and mountains are unique. In the Sierra foothills lies another mining town born in the gold rush named Jackson. If you are driving from or to Yosemite or Lake Tahoe you should choose state route 88 or 49 and paying Jackson a visit since many old facades are well preserved and worth a stop. Jackson, probably named after Colonel Alden Jackson, a local lawyer killed by miners, was founded as a mining camp in 1848. Similar to other camps businesses like brothels, gambling halls, and saloons opened their doors in the tiny village entertaining the miners. Around Jackson there are more former mining camps that preserved their old charm. If you are interested in digging deeper into ‘Gold Rush County’ and its unique atmosphere enjoy the scenic cruise along the hilly road and make short detours through village’s of Volcano, Mokelumne Hills, San Andreas and Angel’s Camp. All are located on State Route 49 between Yosemite and Placerville, except Volcano, which is located at HWY 88 north of Jackson. Volcano was Jackson’s main competitor in becoming the most important town in Armador County on the way to Sacramento. Its most popular sight is the Victorian St. George Hotel, a Californian historic landmark. Coming to Volcano you will find a four-block historic village including the historic Volcano Community Theatre. When miners discovered gold around Mokelumne River the former camp became one of the richest gold mining towns in California. Mokelumne Hills was the largest town and county seat of Calaveras County with a huge diversity of French, German, Chinese, Spanish and Italian residents. With the passing gold rush the population decreased but the community preserved their tiny historic center until today and became a California Historic Landmark. This small town is another California Historic Landmark with an historic town center, including the Calaveras County Courthouse. Believing historians the legendary highwayman Black Bart had his trial in this courthouse. Henry Angel who opened a trading post instead of starting digging for gold founded Angel’s Camp. A smart move since the trading post became a camp for miners. Over several decades gold was mined in Angels Camp developing a town. Nowadays visitors can stroll along the historic Main Street and have a closer look at the rusty gold mine machinery in front of the Angels Camp Museum. 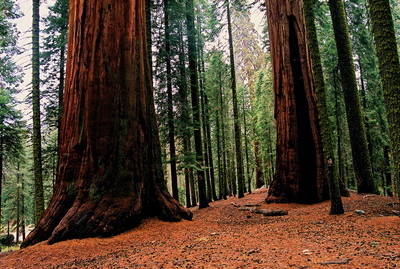 Sequoia National Park is the home of the Giant Sequoia Tree, incl. the General Sherman, the largest tree in the world, 240 discovered caves and Mount Whitney, the highest point of all 48 states. And this is not all: Within the ‘Giant Forest’ Sequoia holds five of the ten largest trees in the world, measured in wood volume. Driving over the Sierra Nevada there is no way crossing the southern Sierra behind Tioga Pass. One reason is that about 84% of Sequoia and Kings Canyon are protected wilderness and you only can hike them or pass them by horses. So everyone with a car, motorbike or RV has to circle the Sierra over HWY 395 or HWY 99. 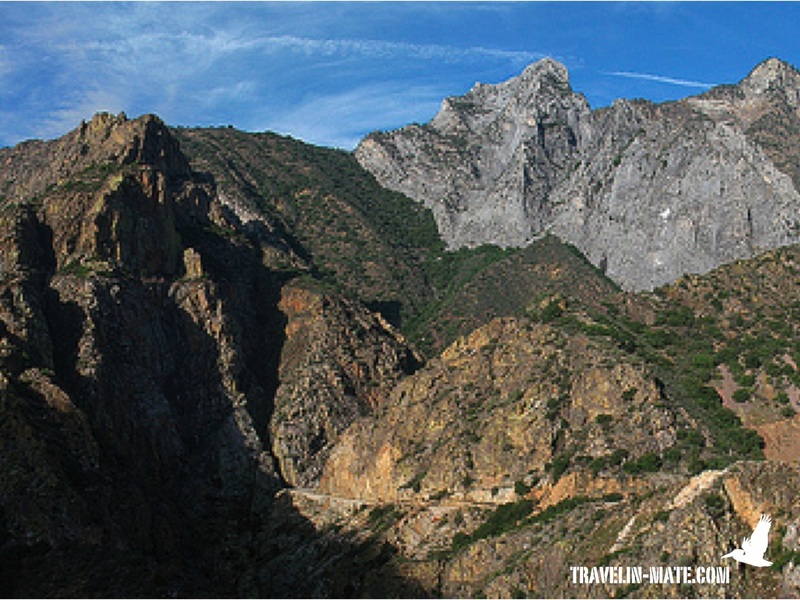 The first residents of Sequoia were the Monachee than mainly lived along Kaweah River. In contrary to other Indian native tribes the Monachee weren’t killed or relocated during battles but infected by the smallpox before the first European settlers took over the area. One of the first settlers was Hale Tharp, a miner, who lived in a small cabin within the Giant Forest. His cabin that was built out of a giant Sequoia was preserved and is open to visitors. Harp started preserving the precious trees, but without success. First settlers started to harvest the trees after their arrival to sell them as timber. Thankfully it turned out that these trees were prone to splinter, so the logging stopped soon. Around the same time in 1890 the National Park Service embedded the Giant Forest as a part of the Sequoia National Park and ever since extended the park’s property. Thanks to the Sierra Club, the park management was even able to protect a huge area from Walt Disney Corporation who was planning to turn today’s Mineral King into a ski resort. 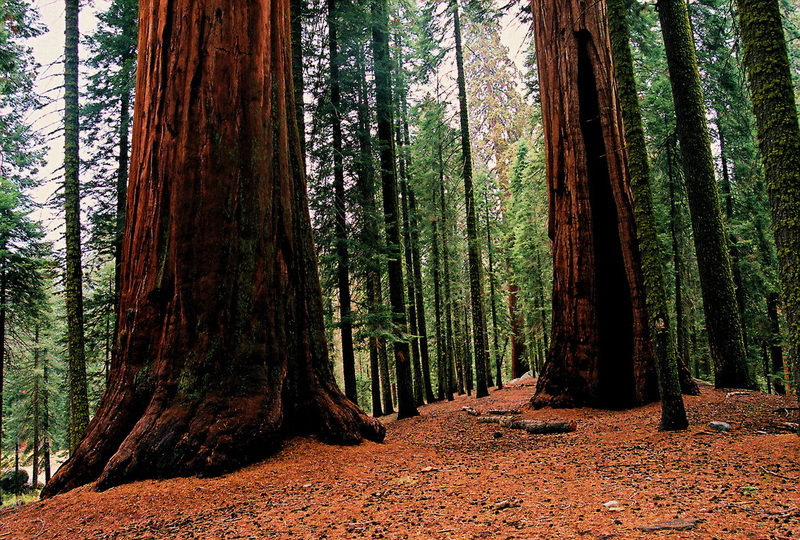 One of the most favorite attractions in Sequoia is definitely the Giant Forest. However you won’t have the area for yourself but will run into a bunch of tourists. Nevertheless if you walk away from the parking lot area it will thin out as usual or if get here early or late you should be able to avoid the masses. You are getting to the forest by taking Generals Highway towards Kings Canyon General Grant Grove. 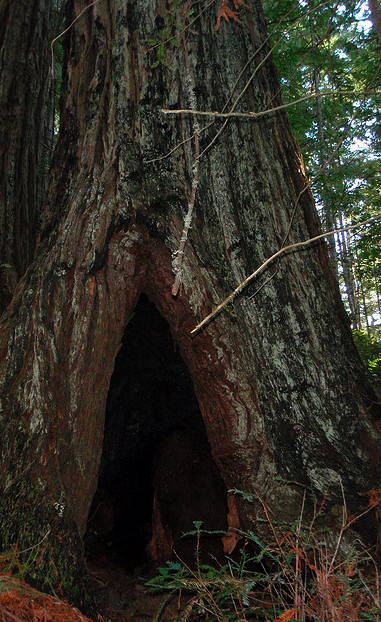 The world’s largest tree is accessible by a 0.8-mile long paved descending trail. On your short hike you will pass the Sequoia Grove with big Sequoia trees named ‘The House’ or ‘President’. Please be aware that this easy and short hike attracts most tourists! I recommend coming here very early or in the late afternoon when it is less busy. From the trail continue along ‘Congress Trail’ that passes General Sherman and leads you to the ‘Trail of the Sequoias’ behind the ‘President’. On this trail you definitely can enjoy the silence and will only share the way with deer and chipmunks for about 2 miles. After 2 miles turn into ‘Log Meadow Trail’ towards Crescent Meadow. On your way you will pass ‘Thag’s Log’ and the ‘Chimney Tree’ where you will hit the hordes again. Circle ‘Meadow Trail’ to return to ‘Congressional Trail’, ‘General Sherman’ and your car. This loop is about 5 miles (8 km). 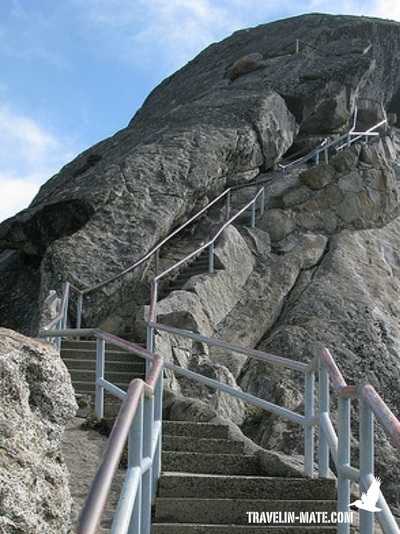 This hike completely exists out of 400 steps bringing ¼ mile up a step staircase and to a granite dome. Since you are approaching a scenic panorama view over the western park area you can be sure you are not alone. 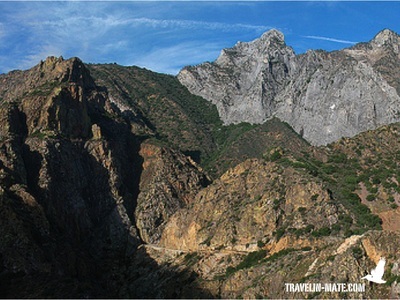 Similar to all other short hikes in Sequoia you are accompanied by the masses. Nevertheless the short work out and the waiting time at the stairs is worth it. A short drive away from the Giant Forest you are reaching Crystal Cave, the only cave in Sequoia National Park that is open to public. A 50-minute guided tour leads you from May – Nov through the marble cave that is originally more than 3 miles long. The only thing you have to be aware of is to purchase your tickets at Lodgepole Visitor Center or Foothills Visitor Center at least 1-1/2 hours in advance. There is no possibility to buy tickets at the cave! Bring yourself a jacket for the tour since the temperature inside the cave drops to around 50F (9 C). You are not allowed to bring strollers, tripods, backpacks, or baby backpacks. The cave is not wheelchair accessible.